I can't remember a time in my adult life when women's voices have seemed more needed than they do today. I spent part of the weekend following tweets from the Women's March Convention, inspired by they way this movement seems to have created a space for voices of many kinds. So what could be more fitting this week to wish a happy pub day to a new collection of short stories which explores the complexities of women's lives and the many-faceted roles they play? 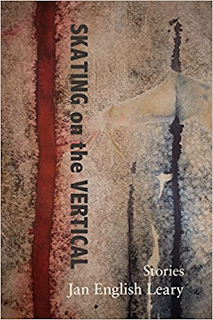 The characters in Jan English Leary's Skating on the Vertical (Fomite Press) are ordinary people, mostly women, chafing against the expectations and boundaries of their roles as mothers, wives, daughters, girlfriends, or teachers. Sometimes they are dealing with specific challenges (eating disorders, self-harm, unexpected pregnancy), but always, it seems, they are struggling most of all to be understood. In many of the stories, the rebellions are quietly internal, but in some of my favorites they are more outwardly dramatic. In "Skin Art," Madeline, a corporate wife, accompanies her husband on a business trip to India. She completely botches her first and only official function, then is left - anxious, unattended and ignored - to struggle alone with her urge to begin cutting herself again. She finds a far more creative means of expression, but her husband, to no one's surprise, utterly fails to understand. In "Alewives," a depressed, middle-aged woman still wearing her robe and slippers drops her husband at the morning train and takes off on a day-long, soul-searching jaunt through the neighborhoods of Chicago, where she discovers her inner guerrilla artist. In the title story, one of a few in which the protagonist isn't a woman, a teenager wrestles with the damaged relationships in his family, struggles to balance his own sense of self with his need to fit in with his peers, and his guilt for participating in an act of bullying. His inner conflicts and furies must, and do, combust. I found these to be engaging stories. As a reader, I was drawn in by Leary's clear and deep compassion for her characters, including - or perhaps especially - their flaws and secrets. I also liked that she explored difficult subjects in ways that encourage deeper consideration, rather than easy conclusions. Most of all, I loved how each of these characters simmered palpably, their emotions bubbling just below the surface, waiting for the right moment to burst into the open. Care. Listen. Come into the world and tell your story. My thanks to the publisher for an advance reader copy of Skating on the Vertical.